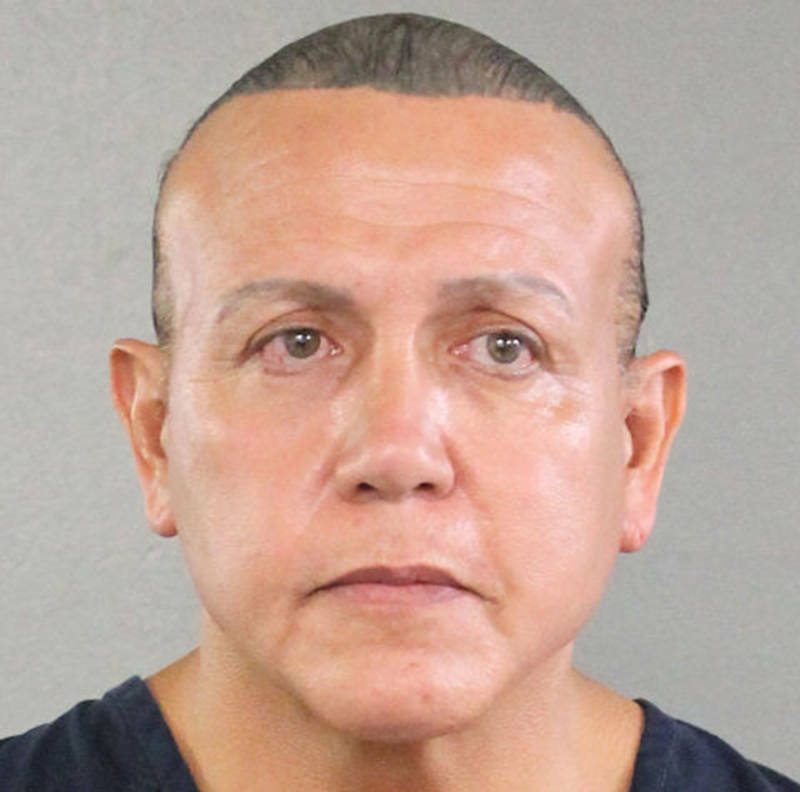 The Justice Department charged a Florida man on Friday in connection with a wave of improvised explosive devices sent to political critics of President Trump. Cesar Altieri Sayoc, 56, is facing five federal charges after he was arrested in Plantation, Florida, following a national investigation. He faces a potential total of 48 years in prison. The homemade bombs intercepted or discovered this week "are not hoax devices," said FBI Director Christopher Wray during a press conference with law enforcement officials Friday. They contained "energetic materials" packed into PVC pipes and could have been dangerous, he said, although none of them exploded and no one was hurt. Asked at the same press conference why it appeared that Sayoc allegedly targeted only liberal political figures, Attorney General Jeff Sessions said "he may have been a partisan ... appears to be partisan, but that will be determined as the case goes forward." 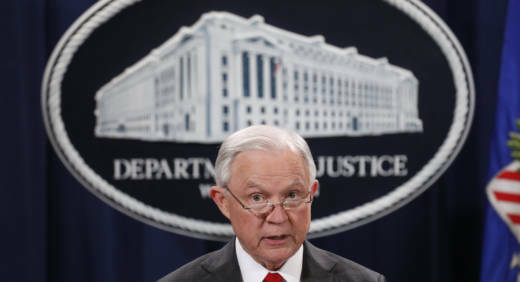 Neither Sessions nor Wray would address directly questions from journalists about political motives and the spate of suspicious packages discovered across the country this week. FBI and other investigators surrounded a white van believed to be connected to the case in a parking lot in Plantation; their inspection was shown live on cable TV and the van was loaded onto a flatbed truck. Court documents later established the van, which was covered with pro-Trump and anti-CNN images, belonged to Sayoc; a former attorney who had represented him told NPR Sayoc has been living in a van for some time. President Trump hailed law enforcement agencies in a statement at the White House and condemned the prospective threats to political leaders. "These terrorizing acts are despicable and have no place in our country," he said. "We must never allow political violence to take root in America. We cannot let it happen." Later, Trump was asked about the apparent support for him expressed by the suspect on social media and on his van, which bears an illustration that appeared to depict Trump standing on a tank holding a rifle before an American flag with fireworks exploding in the background. "Did you see your face on that van, sir?" Trump was asked. "I did not," the president said. "I did not see my face on the van. I don't know. I heard he was a person that preferred me over others, but I did not see that." Trump did reject the idea that he or his statements might be in some way culpable in the attacks. The president alluded to the shooting last year at a mostly Republican baseball practice outside Washington, D.C., in which Rep. Steve Scalise, R-La., was badly wounded. "There's no blame. There's no anything," Trump said. "If you look at what happened to Steve Scalise, that was from a supporter of a different party." Two were recovered in California: One addressed to liberal donor Tom Steyer, who is leading a campaign to impeach Trump, and one addressed to Sen. Kamala Harris. Harris was mentioned in the criminal complaint as a target known to federal investigators; Steyer was not. It wasn't clear whether the parcel he addressed in his statement might be connected to this case. "At this moment, it is incumbent upon leaders across the political spectrum to take seriously the power they hold," said Sen. Harris in a statement in which she also praised law enforcement officials' efforts to investigate the packages. "It is the responsibility of our leaders to use their role as public figures to elevate our discourse and bring people together." NextGen America, a San Francisco-based political action committee founded by Steyer, said in a statement that the suspicious package mailed to Steyer was intercepted at a facility in Burlingame. "We are seeing a systematic attack on our democracy and our rule of law that extends much further than just one isolated terrorist in Florida," said Steyer. "Whether it's voter suppression, voter intimidation, attacks on our free press, gerrymandering or attempted violence — the trust and norms that are the actual basis for our civil society and political system are being eroded." Earlier, a package was discovered in Florida addressed to Sen. Cory Booker, D-N.J., and one in New York City to former intelligence boss James Clapper. The recovery of those envelopes brought the known total to 14 parcels addressed to 12 targets, all of whom are critics or opponents of the president. None of the suspicious devices included in the envelopes has exploded, and so far no one has been hurt. Federal authorities have acknowledged that they don't know how many total packages there are and that there could be more moving through the mail as the search continues both for the devices and for the person or people who sent them. Clapper, who is a commentator on CNN, appeared on air to say, "This is definitely domestic terrorism. No question about it in my mind." Although the homemade pipe bombs have not exploded, authorities say they are treating them as "live devices," not "hoax devices," New York City Police Commissioner James O'Neill said Thursday. Authorities who have discovered the parcels around the country — in New York, outside Washington, D.C., in Florida and in Los Angeles — are sending them to the FBI Laboratory in Quantico, Virginia, for examination there. At least one of the packages passed through a large U.S. mail sorting facility in Opa-locka, Florida, near Miami, according to multiple reports. The Miami Herald, citing a federal law enforcement official familiar with the investigation, reports that the package sent from the facility is likely the one that ended up on Wednesday at the South Florida office of U.S. Rep. Debbie Wasserman Schultz. That package was originally sent to the office of former U.S. Attorney General Eric Holder. It was not delivered and was instead sent to the labeled return address — listed as Wasserman Schultz's office. 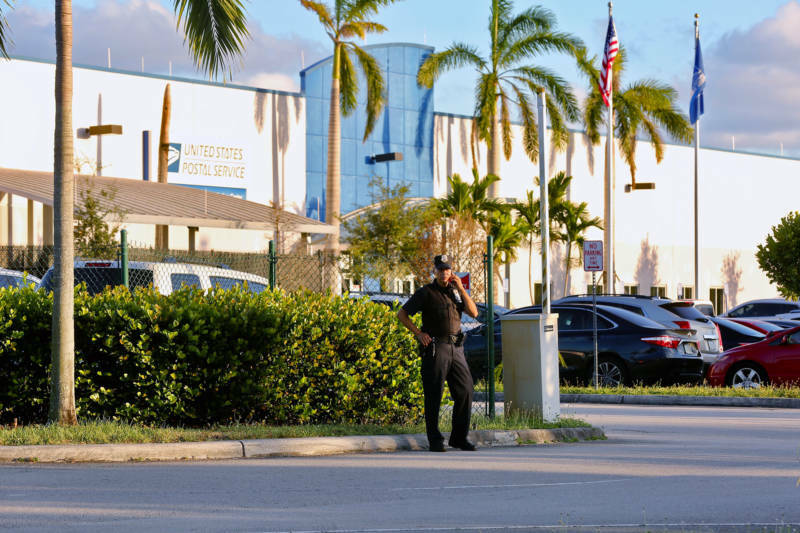 Federal agents and the Miami-Dade County Police Department searched the facility on Thursday night, according to reports from the Herald, Reuters and The Associated Press. No potentially explosive devices were found, according to reports. "A search of a postal database suggested at least some may have been mailed from Florida," the AP reports. Hundreds of thousands of packages pour into the facility every day — it's the size of five football fields, the Herald reports. Miami-Dade Police Department specialists worked at the mail center on Friday morning, the agency said. The packages began to show up on Monday, starting with billionaire George Soros, a major donor to Democrats and Democratic causes. In addition to Steyer, Harris, Booker, Clapper and former CIA Director John Brennan, one package has been addressed to former President Barack Obama, two to former Vice President Joe Biden, one to former Secretary of State Hillary Clinton, one to former Attorney General Eric Holder and two to Rep. Maxine Waters, D-Calif. One was also addressed to the actor Robert De Niro, a harsh Trump critic. De Niro included a political callout in his statement about the packages on Friday morning. "I thank God no one's been hurt, and I thank the brave and resourceful security and law enforcement people for protecting us," he said. "There's something more powerful than bombs, and that's your vote. People must vote!" Trump sounded the same note when he addressed the parcel attacks Friday morning on Twitter. Trump's use of sarcasm quotes around "bomb" appeared to be an allusion to skepticism voiced by some former investigators and explosives specialists about the devices. As one expert told NPR, the apparently homemade devices look like they might include hazardous materials but not as though they could explode. The president changed his tone later in the day after Sayoc's arrest was announced. A wide investigation remains ongoing, with the FBI, the Postal Service and other federal agencies working with state and local authorities.